When wedding time comes the question of what jewelry to buy arises! 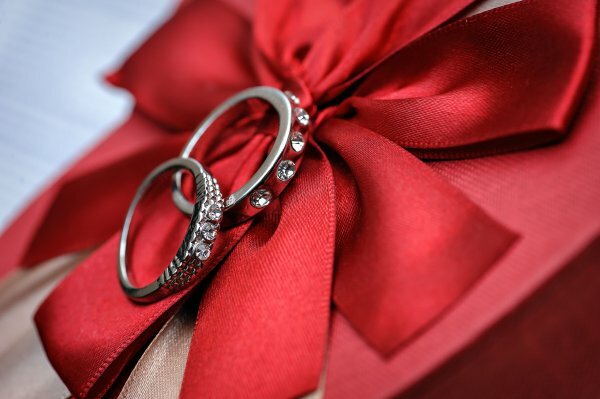 Of the different metals used to make wedding rings and wedding bands, two of the most popular are titanium and sterling silver. And it is easy to get confused because they look alike very much. Should we buy titanium or silver wedding bands? 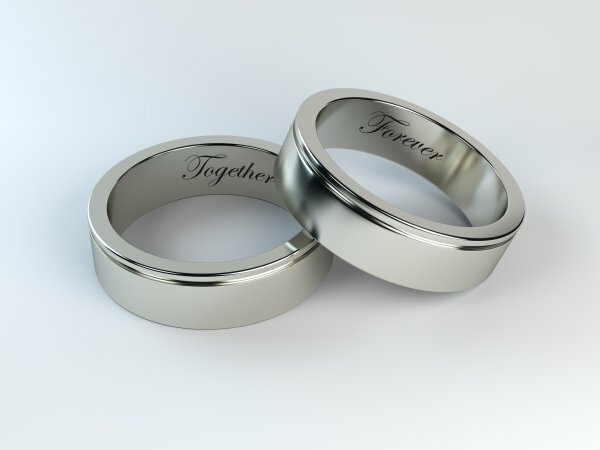 Which one is better: silver or titanium wedding rings? These are just 2 of the frequent questions people ask before weddings. While similar, in many ways, there are distinctive differences that you should know about before making your purchase. Here are some facts about titanium and sterling silver that will help you make the best-informed decision about which one is right for you. While both metals share the alike silver-gray color, silver is more dense than titanium, which means that if we take the equivalent volume of silver and titanium, the weight of silver will be heavier than the titanium piece. Actually, it will be more than twice the weight of titanium because silver’s density is 10,5 g/cm3 while titanium’s density is 4,5 g/cm3. While you can tell the difference when picking up both materials, it may not be all that important when wearing the ring, but if you are considering a thick and long bracelet, you might take weight into account. In addition, to be noted for titanium is that you have one interesting alternative: there is black-coated titanium jewelry. While this coating opens the door to different designs and gives the item a glossy finish, it also provides protection from scratches and increases durability. Although titanium is greatly lighter, it is considerably harder than silver. However, it may not be as big an advantage as you might initially think because being harder also means that titanium is more brittle. On the Mohs scale, which shows hardness, titanium gets a 6 while silver is rated 2,5. While this does not mean you can easily break titanium, it does mean that it has less flexibility compared to the softer silver. It should be known that pure silver is never used to make rings because it is too soft. Always an alloy of silver is used. The most commonly used silver alloy is sterling silver, which has 92.5% silver and 7.5% other metals like copper. Thanks to the other metal alloyed with silver, additional strength, density, and hardness is obtained making it a good jewelry and tableware material. You will add to the tradition is you choose silver. Giving silver gifts have always been a tradition such as silver christening gifts or housewarming gifts. However, the presence of copper also means that sterling silver rings tend to tarnish, which means that you will need to do some cleaning and maintenance to keep the ring shiny and bright. Titanium does not tarnish thus titanium jewelry needs little effort to maintain its appearance. As it does not need any care for removing tarnish, your titanium wedding ring can maintain its beautiful look for a very long time. And when it starts to lose its shine, just ask your local jewelry store for a polish, and you’ll have it bright and shiny as before! One thing we know for sure is that in jewelry prices do vary – a lot! The weight of material used, the design, the brand all add up to the price. And there are times when commodity markets are rallying to take prices to extreme levels such as in 2011 when one-ounce of silver saw $50. That very ounce of silver was at $10 in 2008, and came back down to $15 in 2017 after seeing a 400% gain in 2011. It quintupled and then made a 70% drop from the top! While they look very similar, there are significant differences between sterling silver and titanium. Sterling silver requires more maintenance and is subject to scratching while titanium is lighter, harder and less flexible a material. If you are shopping for rings, this means that if your finger size should change with any real degree, the ring may no longer fit your finger. If you desire a ring that requires less maintenance, you should consider titanium. If you want a ring that is softer and more flexible, then sterling silver is your choice assuming you do not mind the additional maintenance.